This copper roof birdhouse has a Patina finish. This copper and vinyl bird home has 8 separate rooms that include perches and a roof in the shape of a bell. This copper roof gazebo birdhouse is well constructed and will last for many years with no maintenance. 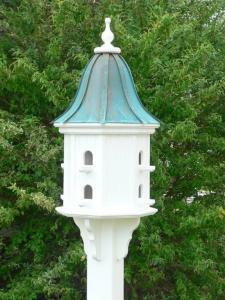 No maintenance is required on this vinyl and copper gazebo bird feeder. The roof lifts up for easy cleaning. Comes with decorative brackets and vinyl sleeve and fits on a 4 x 4 post. Copper roof and cypress shingle roof are also available but not shown.